Bottle of wine, no corkscrew... no problem. Really, there are more ways than you might imagine to open a bottle of wine sans the traditional tool. We recently profiled five popular methods that included everything from the oh-so-trendy "shoe method" to a technique that involves a screw, a screwdriver, and a hammer. But for those of you looking for additional tricks, here are five more techniques to brush up on should you find yourself in a desperate, corkscrew-less, I-need-to-open-this-bottle-of-wine-now situation. Opening a wine bottle with a hypodermic syringe? If your reaction is something along the lines of "Ew, gross!" chances are you're not alone. Still, there are people out there who have attested to having had success with this admittedly odd-sounding method. If you dare, here's how it works: Use a clean (obviously) large-bore syringe, stick it into the cork, and then pump air into the bottle until the cork pops out. If you're in a bind and have to resort to this technique, perhaps just excuse yourself to the kitchen so that whoever you're sharing the wine with doesn't get too freaked out. Although it doesn't involve breaking the bottle in a Champagne sabering kind of way, this technique still comes with a cautionary disclaimer. Ideally you're looking for a thin knife here that is going to fit between the neck of the bottle and the cork. 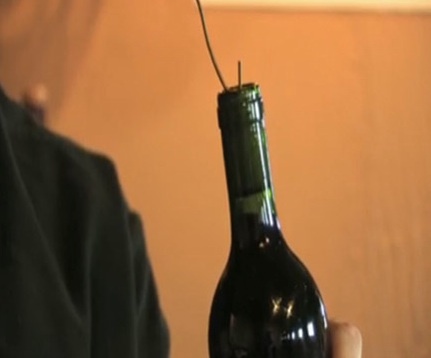 Once the blade is wedged between the cork and the bottle neck slowly wiggle the cork back and forth, twisting the bottle slightly around as you gently pull upwards. Haven't seen the first five ways yet? Click here to check them out.